With the offseason in full swing, SI.com's Rob Mahoney spells out 10 looming free agency questions. Where might LaMarcus Aldridge go? Those with an ear to the ground in the NBA have heard the same whispers for months: Aldridge may not be in Portland for long. Those rumors could soon turn to reality with devastating implications for the Blazers. Already general manager Neil Olshey, contrary to the party line, seems to be bracing his team for the possibility; a pair of trades over the course of this week landed two young big men, Mason Plumlee and Noah Vonleh, who might be forced to step into major minutes next season. Aldridge made the Blazers a cogent, balanced team. His gravity in the pick-and-roll widened passing lanes and created shooting opportunities for Damian Lillard. That he could draw double coverage on a consistent basis cleared the way for Wesley Matthews and Nicolas Batum to spot-up or dive cut. His understated defense helped to solidify a Portland team lacking for exceptional defensive talent. Aldridge’s ability to operate from the high post, the low post, and the top of the key kept the flow of the offense engaged and exacting of its opponents. To remove him from the team would mark the end of the Blazers as we knew them. Aldridge, though, need be concerned with his own future. If Portland doesn’t give him the best opportunities to pursue his professional goals, he owes it to himself to go elsewhere. San Antonio isn’t just a prevalent theory—it’s a perfect one. A present with Tim Duncan could be title-worthy and a future alongside Kawhi Leonard might be even more fruitful. Aldridge will hear cases from the Lakers, the Mavericks, and a host of others. Each will have their appeal. Could any, though, really compare with integration into the Spurs system at such a natural point of transition? What does Kevin Love want? For all the talk about what Cleveland should do with Love this summer, the greater mystery is what Love makes of the new-look Cavaliers. The team’s sustenance behind high-level defense and the emergence of Tristan Thompson would seem to give Love good reason to both return and look elsewhere. Cleveland, as its currently constructed, cannot offer the All-NBA forward the kind of simple, starring role he’s accustomed to. To what extent that matters to him could orient the direction of one of free agency’s biggest dominoes. Cleveland could also offer Love the first five-year deal of his career, a not insignificant gesture for a player with an extensive injury history. Should Love instead favor the flexibility of a shorter deal with built-in options, he could likely find it with any team capable of clearing the necessary cap space. Love could easily get in on the ground floor with a team like the Celtics or Lakers, though neither could promise a spot in the postseason. He could angle to play off of a co-starring lead guard in places like Portland (should Aldridge leave) or Phoenix. He could potentially help to anchor a balanced team like Atlanta. Even after a shaky individual season, the league will open itself up for a star like Love. The freedom, after years in Timberwolves purgatory and a season of questionable fit with the Cavs, to negotiate what he wants most makes Love one of the most powerful and unpredictable elements of the offseason. Will Dan Gilbert stop at anything? As it stands, the Cavaliers are looking to ink LeBron James to a new deal, re-sign Kevin Love to the five-year max, retain Tristan Thompson on what will likely be a near-max contract, match whatever offers come to Iman Shumpert in restricted free agency, bring back J.R. Smith on a fair deal, and leverage Brendan Haywood’s unguaranteed contract to add another player at significant salary. That’s an expensive to-do list. If all goes according to plan, the Cavaliers’ total payroll could eclipse the $100 million mark—a pricey investment that bears a brutal luxury tax penalty. That Cleveland was already a luxury tax team last year also sets them up to pay the even harsher repeater tax in the 2016-17 season. It would be understandable were Gilbert to balk at what he and his front office consider to be the less essential salary-adding moves on their docket. They don’t have to flip Haywood’s contract, after all. His full, $10.5 million salary could be wiped from the books at a time when rich new deals abound for all of the Cavs’ more substantial contributors. Implicit in all of these moves is the threat of LeBron’s contract flexibility. James may well play out the rest of his career on two-year deals with a player option—a device that allows him to maximize his earnings while applying constant pressure to Cleveland’s front office. The thought that James might actually leave the Cavs again seems impossible. The very fact that he could, however, oh so gently encourages Gilbert and general manager David Griffin to keep the team at its competitive best, costs be damned. What is Rajon Rondo worth? No one knows. The question cuts through the dynamics of the market to the crux of what each individual team is willing to pay for in free agency. Rondo’s talent is clear. Yet his fit is demanding (he requires the ball in his hands but needs to be surrounded by scorers) if not altogether poor, his attitude an issue if not an out-and-out dealbreaker. That he couldn’t make peace with his circumstances while playing for a competitive, well-run franchise helmed by one of the best coaches in the game doesn’t exactly stoke his appeal. Further factors in considering Rondo: The larger downward trend of his play since his ACL tear in 2013, the come-and-go nature of his defensive effort, his place in a league where it’s crucial to project as a scoring threat, the damage his flare-ups could do to even stable teams, and that his shot-refusing style only rarely led the Celtics to even decent offensive efficiency. For a team to actively pursues Rondo in free agency would in itself require the perfect context. To then assign a dollar value based on what Rondo could bring to an organization would require the tightrope walking of all kinds of hypotheticals. Any hiccups for Jimmy Butler, Kawhi Leonard, or Draymond Green? Chandler Parsons’ restricted free agency in 2014 proved instructive. Houston’s full offseason itinerary had made Parsons’ re-signing a public assumption. His small cap hold would tide over the Rockets with his Bird rights until other big-ticket deals (with Carmelo Anthony or Chris Bosh) were in place, at which time Houston would make its up-and-coming small forward whole. The basics of that arrangement have played out time and again throughout recent NBA history. Parsons and his representation, however, didn’t have eyes for the Rockets alone and gauged the market as Houston waited for the decisions of the summer’s biggest free agents. What they ultimately found was a maximum-value offer sheet engineered by Dallas to discourage matching. The deal, only three years in length, would contain a player option in its final season and a hefty trade kicker. Houston entertained the option of matching the offer to return Parsons anyway, though ultimately declined. That loss didn’t stand in the way of the Rockets earning a trip to the Western Conference finals. It did, however, create space for doubt in the proceedings of restricted free agency under the current collective bargaining agreement. Butler is fully expected to land a new deal with Chicago, as is Leonard with San Antonio and Green with Golden State. The former two teams even have the ability to prevent a Parsons-like offer sheet outright, should they tender the little-known and little-used ‘maximum qualifying offer.’ Still, what might seem on the surface to be the simplest decisions of free agency have some room for complication. It’s not only Parsons. Recent cases involving Eric Bledsoe, Greg Monroe, and Eric Gordon suggest that the enterprise of restricted free agency can be thornier than advertised. 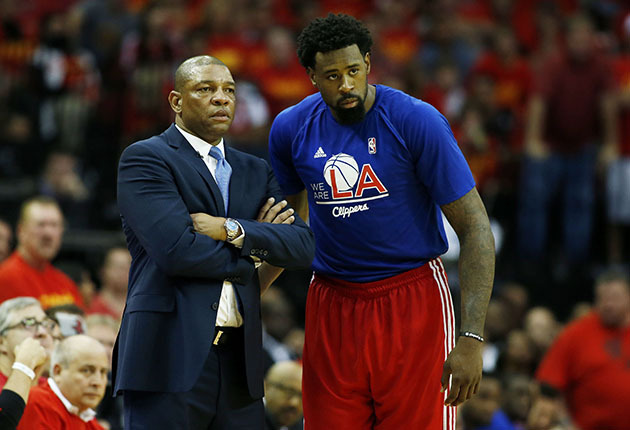 Would DeAndre Jordan leave L.A.? The Clippers seem to think not. In staring down Jordan’s upcoming free agency, Clippers vice president and head coach Doc Rivers traded away the team’s only other true center—​Spencer Hawes—as a means of addressing other roster needs. Intentional or not, that’s a statement move; to strip the roster of its only depth at the position while taking on salary and dealing away Matt Barnes’ unguaranteed contract indicates confidence, blind or not, in the team’s ability to get a deal done. Jordan, who ranks as one of the league’s best rebounders and shot-blockers, will have offers. The market for rim protection is rich enough that the All-NBA third teamer should be in a position to choose between multiple promises of a max contract. Whether any of those teams can rival the basketball appeal of the Clippers depends on what lengths they go to clear the requisite cap room and what role Jordan envisions for himself moving forward. Playing off of Chris Paul and Blake Griffin is a good gig for those who can get it, and even better for those earning top dollar. Still, Jordan may have interests and intentions that go beyond what the Clippers can offer—even if they, by CBA rule, have the power to offer him a more lucrative deal than any other franchise. That advantage is sorely needed. For as important as Jordan may be to the Clippers on the floor, he’s even more crucial in the context of their cap sheet. L.A. has enough core salary ($56.5 million) committed to Paul, Griffin, J.J. Redick, and Lance Stephenson that Jordan’s leaving wouldn’t actually open up sufficient cap room to find a quality replacement. It’s not as if L.A. could move from Jordan to the next attractive free agent center in line; the finances are as such that the Clippers would need to either re-sign (via Bird rights) or sign-and-trade Jordan in order to maintain their play of a season ago. All other trajectories point to a steep, vicious decline. What is market for Dwyane Wade? The enduring star of the Miami Heat has made a slight fuss in opting out of his contract. Reportedly, per the Miami Herald, Wade turned down his $16.1 million player option to pursue a three-year deal netting him $20 million on average. Whether such a deal could exist for him outside of Miami would seem to rest on the Heat’s willingness to participate in a potential sign-and-trade. Otherwise, those teams with adequate cap space to offer Wade a near-max deal aren’t in a position where it makes sense for any party involved. The Lakers, who were linked to Wade as a potential suitor, would seem to have different priorities after drafting D’Angelo Russell on Thursday. The Knicks made choices on draft night that suggest they are finally willing to participate in a gradual, patient rebuild—the kind hardly compatible with a 33-year-old star aging out of his best years. Teams like the Sixers wouldn’t have much use nor appeal for Wade, and those like the Blazers—who have the potential to clear cap room once other free agent dominoes fall—won’t likely be able to give Wade the same roster support he’ll find in Miami. That Wade would want more money on a longer deal makes sense, particularly for a player who has never once hit the $20 million threshold. His career earnings are less than those of Tyson Chandler, Zach Randolph, and Shawn Marion. He made salary concessions in order to bring in LeBron James and Chris Bosh in 2010. He signed a team-friendly deal last summer as to maximize the Heat’s flexibility. Now Wade, in what could be his last big-money NBA contract, is looking to get his. Whether he can find that in any other market and with any other franchise is one of the summer’s biggest open questions. Effect of Wesley Matthews’ injury? When healthy, Matthews is the kind of player that every franchise would be lucky to have: Ultra-competitive, comfortable within his role, and solid in the supporting skills that are viable in any system. The rupture of his Achilles’ tendon changed all that. Matthews is no less proficient or determined than he was earlier in the 2014-15 season. His body, however, is now subject to an injury that has altered careers and forced some older players into retirement. Matthews’ career shouldn’t be compromised on that level, though the fact that such a sentence even needs to be written illustrates the risk built into his free agency. Medical staff can aim to predict how Matthews might play following his rehabilitation. The hard truth is that they—and Matthews—can’t possibly know. Every team is left to work from the mere assumption of what Matthews might be capable of over the next few years of his career, adding another layer of uncertainty to an already ambiguous marketplace. Which contender will get a steal? Cory Joseph, whose restricted free agency with the Spurs could be complicated by their big-picture ambitions; Thaddeus Young, who played well in Brooklyn but not so well as to command top dollar; David West, who walked away from a $12.6 million player option to seek out a better fit; Monta Ellis, who will surely want a richer deal but may not find one; Paul Pierce, who played for the mid-level last season and could sign for even less to join an elite team; Arron Afflalo, a solid but unspectacular guard; and Omer Asik, the defense-only center who would do best on a loaded offensive team. Can Greg Monroe find a home? Monroe, a restricted free agent last year, accepted the risk of playing out his season on the one-year qualifying offer so that he could dictate his own future. With that power comes the ability to find a better basketball fit than Detroit—a coach and base lineup that might be more accommodating to both his strengths and weaknesses. New York, long a rumored destination, would a fair choice; the triangle offense suits Monroe, and if nothing else Carmelo Anthony and Kristaps Porzingis might help him space the floor. That said, Monroe and his agent, David Falk, should look first for a defensive-minded frontcourt counterpart who could make the life of the 25-year-old big man that much easier. Those NBA bigs who can both stretch the floor opposite Monroe and protect the rim in his stead are precious few. The latter, though, would go a long way toward alleviating Monroe of responsibility he isn’t suited for. His defense improved over the course of the 2014-15 season. Still, Monroe is in no place to serve as the defensive backbone of a team with any playoff aspirations. His search for the right fit, the right coach, and the right kinds of teammates continues.